Can tolerate light frosts in warm climates, where cuphea can be grown as a short-lived perennial. 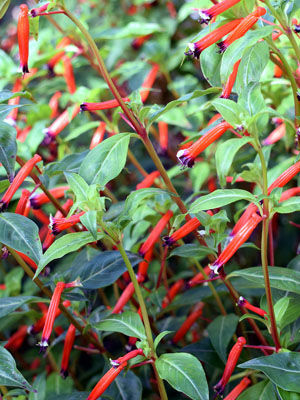 Combine with other annuals that attract hummingbirds, such as salvias. Sow cuphea seeds in moist seed starting mix and keep them warm until the seeds germinate. Most gardeners buy cuphea plants, which often are grown from rooted cuttings. Allow 12 inches (30cm) between taller varieties. This is a great summer flower for areas with hot summers. Japanese beetles are fond of cuphea foliage.